The default control template for the TextBox control changes the color of the Border around the control when the control gets focus. 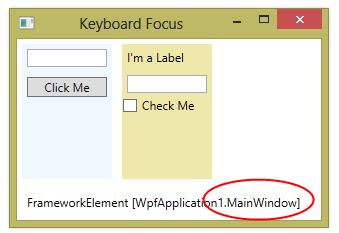 It does this by using a trigger hooked to the IsKeyboardFocused property. You can add your own triggers related to keyboard focus by defining a custom property trigger. 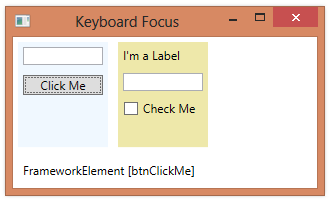 The XAML fragment below defines a new Style element that changes the Background of the control when IsKeyboardFocused is true. As we tab between the two TextBox controls, the one with keyboard focus will have a Honeydew-colored background, as well as the default blue border. When keyboard focus changes from one control to another, the events fired by the controls are in the order listed above. 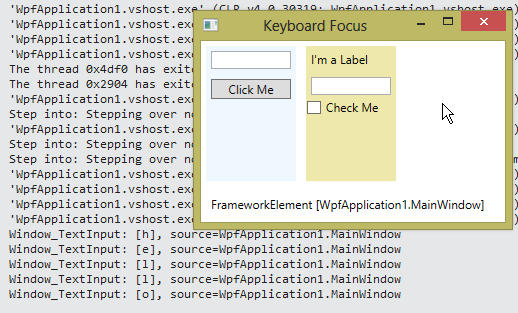 When you first start a WPF application which contains elements that can get keyboard focus (e.g. 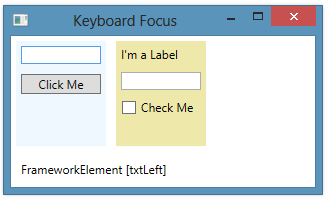 TextBox), it’s the main Window that has the keyboard focus when the application starts. We can see this by using code that reports the current keyboard focus within a Label at the bottom of the window. If we attach an event handler to the main Window for the TextInput event and use the handler to log information about the event, we can start typing after the window comes up and see that the Window is getting TextInput events based on what we type. Nothing is rendered to the screen, but our logging indicates that TextInput events are being fired, with the main window as their source. 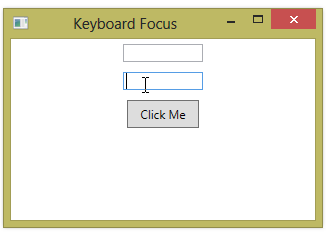 In WPF, controls that a user interacts with are typically able to get keyboard focus. (Focusable property is true). This includes controls that supported text-based input, like the TextBox. But it also includes controls that the user typically interacts with using the mouse, rather than the keyboard. Controls that cannot get keyboard focus are ones like the Label that the user does not interact with. For example, a user will typically use only the mouse when interacting with a Button or a CheckBox, but both of these controls can get keyboard focus. This is because the user can also interact with these controls using the keyboard. (E.g. Enter key to “click” a Button, or Spacebar to toggle a CheckBox). The example below uses code to detect which control has focus. Note that as we tab through the controls, the TextBox controls get focus, as well as the Button and the CheckBox. A control has keyboard focus if it can accept input from the keyboard. The sample code below is a working app that lets us experiment with keyboard focus by setting a Label to indicate which control has focus. 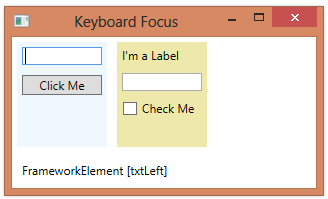 XAML includes some controls and defines a GotKeyboardFocus for the top-level Window. 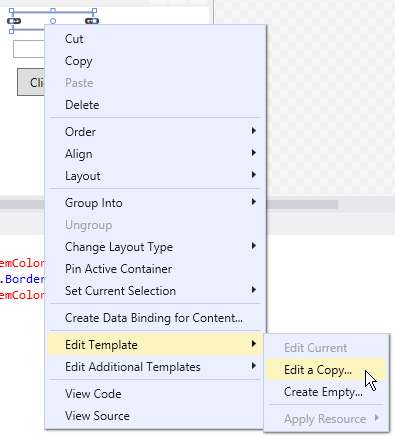 Code-behind uses this code to set property indicating who has focus. string identifier = ((felem.Name != null) && (felem.Name.Length > 0)) ? string identifier = ((fcelem.Name != null) && (fcelem.Name.Length > 0)) ? You can give focus to a specific control at run-time using the Keyboard.Focus static method. You can also give focus to any control that inherits from UIElement using the control’s Focus method.